Nerd Love Story: Oh, March... Where Have You Gone? Oh, March... Where Have You Gone? So, um. March was interesting. Awesome, but interesting. My poor cute husband. He was having severe stomach issues, to the point that he was being crippled to the floor in pain. Yeah. No fun. So we took him to the ER late on a Thursday night, around eight o'clock, and weren't out until after midnight. It was a neat experience. Unfortunately, they couldn't determine for certain what was wrong, so they diagnosed it as "early onset appendicitis". Apparently the fluids he received will supposedly do him a lot of good and keep it from setting in. But who knows. Craziness! It was actually pretty fun, though. I panicked a little bit, for sure! Seriously, semi-panic attack as we were heading to the hospital. 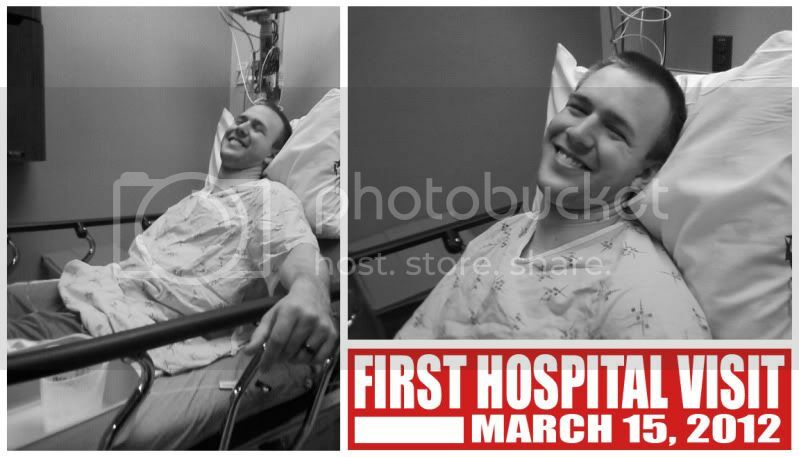 But then they got Brad on morphine and he just became to most friendly, happiest, smiling person in the world--and it was the funniest thing ever. He just kept telling me, "You're pretty," with a huge, goofy grin on his face. So cute, that boy! As a side note, I had to walk out of the room when they were putting his IV for the morphine and the fluids in... so I wouldn't pass out. Don't make fun. Okay, fine, make fun. But yeah, we were just sent home with some highly effective pain meds and were basically told to keep our fingers crossed that the fluids had helped enough to clear any chance of appendicitis setting in. So far it looks like it's worked, because Mr. Bradley hasn't keeled over or anything... still keeping our fingers crossed (for him to stay healthy, not for him to keel over). How was the movie? Ah. Maze. Ing. Seriously. Oh dear, get ready for a nerdfest. Such a great adaptation! I know everyone likes to ask, "But is it better than the book?" but really, comparing a book to a movie is like comparing apples to oranges. Impossible. I will say two things that I suppose are comparison-like in manner: One, the added scenes to the movie, especially those with Seneca Crane and President Snow... brilliant. Such a good decision, they add a lot to the plot and to the second movie. Two, my only complaint was that I feel like for the Hunger Games we didn't see like a lot of hunger. But that really wasn't a necessary plot device. Oh, I guess three things, but I also thought Rue's participation in the story was cut a little short. But the scene they added of the rebellion in District 11 instead of more Rue time... so good. So, so good. And again, valuable to helping people to understand the second movie. Okay, I'm done boring your brains, I promise. Overall, March taught us two things: Number one, diagnosing stomach pain is apparently like asking someone to find a specific star with no telescope... or some sort of simile like that. And two... the odds ARE in our favor. Or some sort of Hunger Games reference like that. P.S. Umm... and I guess I should be asking where April went to? Um, finals ate it?